The left image, taken with the Hubble Space Telescope, shows the body of M82 in blue and hydrogen gas breaking out from the central starburst in red. 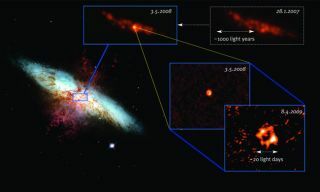 The VLA image (top left) clearly shows the supernova (SN 2008iz), taken in May 2008. The high-resolution VLBI images (lower right) shows an expanding shell at the scale of a few light days and proves the transient source as the result of a supernova explosion in M82. An elusive supernovaexplosion, detectable only in radio wavelengths, was discovered last month inthe nearby galaxy M82. The object,dubbed SN 2008iz, is the closest supernova discovered by scientists in the pastfive years. It would have been visible even to amateur telescopes, were it notfor the dense gas and dust surrounding the exploding star, which left itinvisible in every part of the spectrum except the radio wavelengths. Thesupernova's home galaxy, M82, is an irregular galaxy in a nearbygalaxy group located 12 million light-years from Earth. Despitebeing smaller than the Milky Way, it harbors a vigorous central starburst inthe inner few hundred light-years. In this stellar factory more stars arepresently born than in the entire Milky Way. M82 isoften called an "exploding galaxy," because it looks as if being tornapart in optical and infrared images as the result of numerous supernovaexplosions from massive stars. Many remnants from previous supernovas areseen in radio images of M82, and a new supernova explosion was long overdue. Astronomershave been waiting to catch the next big blast for more than 25 years and hadstarted to wonder why the galaxy has been so silent in recent years. In theend, it took a little digging and looking in the right wavelengths. The newdiscovery was first made when Andreas Brunthaler of the Max-Planck-Institut furRadioastronomie in Bonn, Germany, examined data from April 8 with the VeryLarge Array (VLA) of the National Radio Astronomy Observatory, aninterferometer of 27 identical 25-meter telescopes in New Mexico. "Ithen looked back into older data we had from March and May last year, and thereit was as well, outshining the entire galaxy!" Brunthaler said. Radioemission can be detected only from core collapse supernovas, where the core ofa massive star collapses and produces a black hole or a neutron star. It isproduced when the shock wave of the explosion propagates into dense materialsurrounding the star, usually material that was shed from the massiveprogenitor star before it exploded. Butobservations of M82 taken last year with optical telescopes to search for newsupernovas showed no signs of this explosion. The supernova is also hidden onultraviolet and X-ray images. Thesupernova exploded close to the center of the galaxy in a very denseinterstellar environment, which could explain why M82 has been silent for solong: many of these events may actually be something like "undergroundexplosions," where the bright flash of light is covered under huge cloudsof gas and dust and only radio waves can penetrate this dense material. "Thiscosmic catastrophe shows that using our radio telescopes we have a front-rowseat to observe the otherwise hidden universe," said Heino Falcke of theUniversity of Nijmegen/ASTRON. Bycombining data from the 10 telescopes of the Very Long Baseline Array (VLBA),the VLA, the Green Bank Telescope in the USA, and the Effelsberg 100-metertelescope in Germany, using the technique of Very Long Baseline Interferometry(VLBI), the team was able to produce images that show a ring-like structureexpanding at more than 40 million km/h or 4 percent of the speed of light,typical for supernovae. The teamestimates that the supernova exploded in late January or early February 2008.Only three months after the explosion, the ring was already 650 times largerthan Earth?s orbit around the sun. Thediscovery will be detailed an upcoming issue of the journal Astronomy &Astrophysics Letters.